This month’s musings features Brianna Wassink, violinist with the Bloomington Symphony. We are grateful to Brianna for being brave and sharing her story. We hope you enjoy this Musician’s Musings! I’ve always been shy. As I’ve gotten older, I’ve learned ways to overcome my shyness, but it’s always there and definitely a part of my personality. As much as I wish sometimes that I was more naturally outgoing, I have my shyness to thank for my career as a violinist and orchestra teacher. That was 25 years ago. 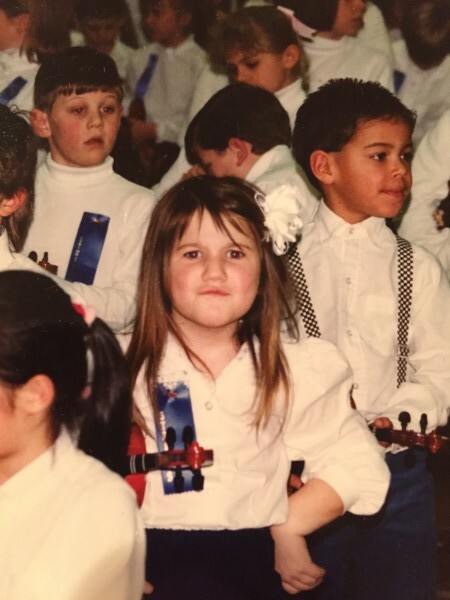 Little did we know, my mom’s decision to allow me to start taking violin lessons would change the course of my life. I played violin all through high school, then went to Luther College and earned a Bachelor’s degree in K-12 Instrumental Music Education. I joined the BSO in 2007 when I moved back to the Twin Cities after college, and I’m happy to now be on the Board of Directors. Professionally, I’m teaching 4th, 5th, and 6th grade orchestra in the Roseville Public School district, teaching 550 students how to play the violin, viola, cello and bass. It’s a lot of work, but I love what I do and it’s very rewarding. That last paragraph almost didn’t happen, though, thanks to my shyness. Not long after starting those violin lessons, I came to the realization that playing a violin is actually pretty difficult. You can’t just pick it up and all of a sudden play really well… It takes a lot of time, practice, and effort. Funny how kindergarteners don’t think of things like that when they decide to start a new instrument, isn’t it? Over the years, there were many times I wanted to quit. It was too hard, it was too frustrating, I was never going to get it. My mom, in all her wisdom, always responded the same way: “Fine, but you need to be the one to tell Mrs. Loing.” Mrs. Loing was my violin teacher from kindergarten until 5th grade, and I adored her. She was kind, patient, and understanding, but always had high expectations. I’m still grateful to her for showing me how to teach that way, long before I had any idea that I would someday become an orchestra teacher myself. I couldn’t fathom having to tell Mrs. Loing that I wanted to quit; she would be so disappointed in me. So, thanks to that shyness that has plagued me my entire life, I never worked up the courage to tell Mrs. Loing I wanted to quit. So, I just kept playing. After a while, with practice and Mrs. Loing by my side, it eventually started to get better… I could hear myself improving, I played great music and made great friends playing in my school orchestras and local youth symphonies, and my cat wasn’t running to the other room every time my violin came out of the case anymore! Before I knew it, I was a violinist. A shy violinist, yes. But a violinist nonetheless. It’s my hobby, my career, and my passion all rolled into one amazing experience. I’m grateful to be a part of the BSO, and for the wonderful friendships I’ve developed over the years, and the beautiful music we’ve made together.